Through monthly Webinars and a community where you can both ask questions and share ideas and challenges with users from around the country, you’re no longer fighting your battles alone. BONUS - there are several members who are also Dentrix trainers. "We have all worked in a dental practice, so we understand your questions and how these issues affect your happiness. Think about how amazing life could be if your software didn’t slow you down." "From clinician to an admin role in the practice, Novonee has given me peace of mind knowing a helpful resource is just a click away." Raise the bar on your team's Dentrix knowledge? Create a more stress-free work environment? Break through your production plateau? Learn and network with other passionate professionals? If the answer is "YES" then it's time to join the Premier Dentrix Online Community! Your entire dental team, including doctors, will learn how to streamline systems, create more efficiency and reduce stress in your practice. How? 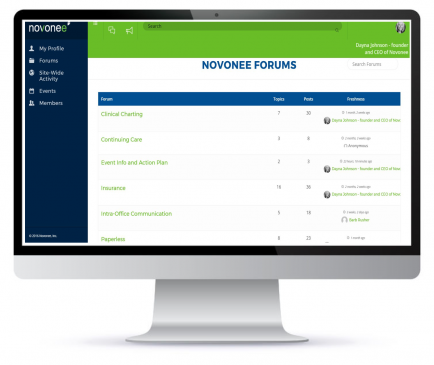 By taking advantage of the educational webinars, ask your specific questions in the online forum, and by networking with other Novonee Super Users within the community. It's time to find out for yourself what Nonovee can do for you and your team! Still Not Sure If The Benefits of Novonee Are Right For You? Watch the video to learn Dayna's story and why she created this powerful online community for passionate dental professionals who want to uplevel their game in Dentrix. Are you on track to become a Super User? I want to be a Dentrix Super User! What do Novonee members love about their online community? Become Novonee's newest member TODAY! Take the next step in maximizing your practice's Dentrix software by becoming a member. Your whole team will benefit from the rich material, Dentrix experts, and strong community.